The following are excerpts from Mahmud’s Diary, chronicling the time The Master, Abdu’l-Baha’ spent in Glenwood Springs, Colorado in September of 1912. The published versions currently in circulation have been altered, changing the order of events on the Masters trip from the time of his departure from Denver, during his time in Glenwood Springs, until his departure from Glenwood Springs. The original of Mahmud’s Diary was given to Kay and Victor Woods in Glenwood Springs in 1987 by Kay Zinky and is archived in the Baha’i Archives Under the Provisions of the Covenant. It is here being reconstructed on this anniversary of The Masters time in Glenwood Springs which also coincides with the rare, Super Blood Moon Eclipse of September 2015, to match Kay Zinky’s original manuscript. The train passed through the Rocky Mountains of Colorado. Some of these rose precipitously like walls from the railway bed, formidable and immense. Gazing at their summits one felt as if the mountains would fall down. In Mahmud’s original description he relates that when passing through Glenwood Canyon and seeing the mountains stretching high above the train he and the other companions became terrified. He saw the massive mountain rock forms towering overhead and felt like they were giant demons and they feared they would fall down on them at any moment. In order to comfort them Abdu’l-Baha told them the story of Muhammad and the Cave. Or the spider snare a phoenix in her web? If the loving seekers wish to live within the precincts of the Attracting One (Majdhúb), no soul may dwell on this Kingly Throne save the beauty of love. This realm is not to be pictured in words. In him are lunacies seventy-and-two. Servitude enslaveth, kingship doth betray. These are a people who deem the lowest place to be one with the throne of glory, and to them beauty’s bower differeth not from the field of a battle fought in the cause of the Beloved. Crazed, he sought the Tavern where the wine they buy and sell. The pain of Thee hath firmly barred the gate of hope as well. In this realm, instruction is assuredly of no avail. His face their lesson and their only book. Not on learned chapters and dull themes they look. The Cyclic Scheme, to them, is but to Him a stair. O Lord! O Thou Whose bounty granteth wishes! I stand before Thee, all save Thee forgetting. Merge with Thy mighty sea. Thus do I say: There is no power or might save in God, the Protector, the Self-Subsistent. Around midnight `Abdu’l-Bahá became fatigued owing to the speed and motion of the train. We proposed that because California was still some distance away, if He would consent, it might be a good idea to stop for two or three days. At 2:00 a.m. the train reached Glenwood Springs, beautifully situated near many hot springs. We stayed at the Hotel Colorado, which is a fine hotel overlooking the river, nestled among green parks and wooded mountains. When He returned to the hotel He stood outside in the garden and said, `It would be good to eat here.’ The garden was adjacent to a large pond with fish of various colors and was enclosed on three sides by the hotel structure. Having seen the Denver newspapers, the hotel manager recognized the Master and us from photographs. Without waiting for the Master’s request, the manager instructed the waiters to serve lunch in the garden. A large table was spread with beautiful chairs. The Master sat down and instructed His companions to do the same. Both before and after lunch the Master generously tipped the waiters. When the residents of the hotel saw the majesty and glory of the Master they told others. Groups of people approached Him. Others watched from their rooms and balconies. Many were heard to say, `How nice to dine this way. It is evident that this is a very prominent person.’ Gradually the purpose of `Abdu’l-Bahá’s mission dawned upon the hotel guests as they were informed of the Cause of God. The Master and His party left Glenwood Springs at about midnight. Glorified art Thou, O Lord my God! I yield Thee thanks for having enabled me to recognize the Manifestation of Thyself, and for having severed me from Thine enemies, and laid bare before mine eyes their misdeeds and wicked works in Thy days, and for having rid me of all attachment to them, and caused me to turn wholly towards Thy grace and bountiful favors. I give Thee thanks, also, for having sent down upon me from the clouds of Thy will that which hath so sanctified me from the hints of the infidels and the allusions of the misbelievers that I have fixed my heart firmly on Thee, and fled from such as have denied the light of Thy countenance. Again I thank Thee for having empowered me to be steadfast in Thy love, and to speak forth Thy praise and to extol Thy virtues, and for having given me to drink of the cup of Thy mercy that hath surpassed all things visible and invisible. Thou art the Almighty, the Most Exalted, the All-Glorious, the All- Loving. O Lord! Open Thou the door. Provide the means, prepare the way, make safe the path. That we may be guided to those souls, whose hearts are prepared for Thy Cause, and that they may be guided to us. Verily, Thou art the Merciful, the Most Bountiful, the All-Powerful. Izzat 7, 172 Baha’i Era (9/14/2015) Covenant Breakers Corrupt Baha’i Holy Books! COVENANT-BREAKING “BAHA’IS” CORRUPT THEIR OWN HOLY BOOKS! VIOLATORS OF THE COVENANT ERASE: “SEVENTH ANGEL PROPHECY”!! “And the seventh angel sounded; and there were great voices in heaven, saying, The kingdoms of this world are become the kingdoms of our Lord, and of His Christ; and He shall reign for ever and ever.” That angel refers to human souls who have been endowed with heavenly attributes and invested with an angelic nature and disposition. What VIOLATION could be clearer than this? The date for the coming of the “Seventh Angel… a man… who will arise…” is given by ‘Abdu’l-Baha as the year 1963 AD in the book Baha’u’llah and the New Era, chapter “Prophecies of Baha’u’llah and ‘Abdu’l-Baha” subsection “The Coming of the Kingdom of God.” Here ‘Abdu’l-Baha explains that there are to be 1335 prophesied years (as given by Daniel in chapter 12 of the Holy Bible) added to the Victory of Muhammad in 628 A.D. that brings us to 1963 A.D. the date for the advent of the promised 7th Angel who will “establish the Kingdom” (628 + 1335 years = 1963). The removal of this prophecy by the Covenant-breakers really only calls more attention to the fact that this prophecy is fulfilled by Dr. Leland Jensen. In fact no one else in history has ever even claimed to be the Seventh Angel other than Dr. Leland Jensen. The prophecy sates that this “angel” will actually be a “man.” That is a real living human being. He will arise with “heavenly qualities and character,” and he will “establish the Kingdom.” Due to the fact that the “Hands” did away with the Kingship of King David through Baha’u’llah and ‘Abdu’l-Baha from the Baha’i faith (or their own isolated corrupted version of it) we see that Dr. Jensen is the only one who stood up against this while it was happening during the years 1957-1963. Even when the rest of the followers of ‘Abdu’l-Baha’s son started claiming rival false “guardianships” only Dr. Leland Jensen kept defending and proclaiming the Covenant of the Davidic Kingship and throne of King David continued as the presidency and “executive” branch (W&T, p. 15) of the authentic Universal House of Justice of Baha’u’llah (www.UHJ.net). Only Dr. Leland Jensen fulfills all these real life deeds and accomplishments and he and he alone explained that he fulfilled the prophecy of ‘Abdu’l-Baha in SAQ for the “Seventh Angel.” As that date of 1963 has come and gone–no one else ever will. As we have absolutely demonstrated that Dr. Leland Jensen fulfills these prophecies for the one to arise in 1963 AD, the “Seventh Angel” the Covenant-breakers have had no other recourse than to expunge this prophecy of the Seventh Angel “a man… who will arise [in 1963]” from the Baha’i religious holy texts. They have done this to try to COVER-UP their violation but instead this has backfired as it only calls more attention to the Seventh Angel prophecy! This glaring violation of the holy writings–shows that our progress (www.BUPC.org) in teaching this faith has progressed to such a point that the majority of people are becoming wise to the fact that the “Hands” have violated the Covenant and that God has sent a promised one, someone who is not a guardian of the Baha’i faith, but an establisher: like Ali the 5th angel and Quddus the 6th angel–that ‘Abdu’l-Baha also explains–now a 7th angel, the establisher of the Baha’i Faith, Dr. Leland Jensen. Further these Covenant breakers have removed the very “Kingdom” from this same passage and have added their own false interpolations: as it is the very Kingdom of God–that is of the Kingship of King David–that is to be established. Thus they have attempted to fool the people away from the Kingdom of God with the living Davidic Kingship as the president of Baha’u’llah’s true UHJ (www.UHJ.net). They have done this further corruption of the texts knowingly and purposefully because so many people today are waking up to the reality that Baha’u’llah and ‘Abdu’l-Baha are seated upon the throne of King David that is to last for ever; and realizing that the whole Baha’i world went astray when they broke the Covenant and separated themselves from ‘Abdu’l-Baha’s son, grandson and great-grandson who is seated upon the throne of David today. The entire Baha’i World went astray except for Drs. Leland Jensen and his wife Opal, the last remaining two Knights of Baha’u’llah who alone remained firm in Baha’u’llah’s Covenant. Dr. Leland Jensen is the establisher of the Baha’i Faith, the “7th Angel” and the educator of the current living guardian seated upon the throne of David alive in the world today. This bad move on the part of the mainstream sans-guardian Covenant-breaking outfit only serves to call more attention to the “Seventh Angel Prophecy” for those who remain watchful and awake. The rest of the masses of the people are now further poised to fall into the darkness of more grievous error as they read texts that are altered and changed deliberately to keep them imprisoned in the darkness of the lies of these glaring Covenant-breakers who only masquerade as “Baha’is” foisting corrupted Copies of the original full passages. PS The individual friends, Councils and Baha’i centers throughout the world are free to distribute this letter for wide circulation as part of their own press releases alerting the world to these forgeries. A long time ago, we, like all other people were sent a Prophet who gave us instructions on how to walk a life path in harmony with the Creator’s all-encompassing plan. Along with those instructions we were given a three-part Covenant symbolized as a bow, to keep for all generations after that prophet’s departure from us. We were told that if we kept that Covenant we would remain as One People pure of heart and thereby be able to recognize Baha’na, the Promised One whom our Prophet told us would come as his return to us in a far distant future. We were told that we would have to make a choice at that time. One of the proofs of the authenticity and veracity of the Promised Baha’na would be that he would possess the full knowledge of the symbols on a small, broken stone tablet given to the Hopi of the Fire Clan by our Prophet and the meaning thereof, a knowledge withheld from us when only part of it was left with us by the Prophet upon his departure from us. We were also told that in that future time, if we remained firm in the Covenant the Prophet made with us, the Baha’na would point to another Promised One whom our Prophet called “The Guardian of The Land”. Sadly, as a people, we failed to uphold the three-part Covenant we made with our Prophet. This is however, not a judgement, rather this is a lesson, an opportunity for all of us to turn back onto the path of the One-Heart and take up the bow of that Covenant once again in this hour. When the first atomic bombs, those “gourds of ashes” our prophet told us would be created by the two-hearts and cause such misery and destruction upon the land as had never been known were test-detonated near our sacred lands, we knew it was time to send out our emissaries to tell our white brothers it would be a grave mistake to use them. Our pleas fell on deaf ears. Many years later, one among our traditional, spiritual elders named Grandfather David Monongye had a vision by which he was made aware of the fact of the return of that Prophet from our ancient history, in the person of the Promised One our prophet himself said would be sent to us at a time of great peril, the one he called Baha’na. At that time, Grandfather David and those who remained traditional among our people sent out emissaries, this time to seek out and contact the Promised One known by the Hopi as the Baha’na in an effort to learn his New Song and sing it to the world to bring about a new world of peace and justice for all people, the prophesied Fifth World. One of those emissaries succeeded. Unfortunately when she returned to tell of her success in finding and learning from Baha’na, she, along with her good news, was rejected by the Two-Hearted ones living amongst the Hopi who had other intentions than to learn the New Song of the Baha’na. Because of this the Bow of the Covenant remained broken upon the dust of the earth in Hopi Land for the remaining days of Grandfather David’s life. Grandfather David saw many signs in the heaven of his vision that confirmed the presence of the one we call Baha’na, our True White Brother, that Promised One, who was alive in the world at that time. Among the signs he witnessed was the fulfillment of the prophecy regarding the turning of the children of the White Conquerors back to the way of peace in the days of the Baha’na. The prophecy says that they would grow their hair long, travel and gather throughout the land and they would be called by a name that was almost like Hopi. These were the Hippies of the 1960’s. Many years later, when Grandfather David heard of the gathering of the Rainbow Tribe he, along with a group of Traditional Hopi attended it in New Mexico in 1977 and presented the Hopi history and Prophecy to them. Grandfather David confirmed the fulfillment of prophecy when he said to the Hippies of the Rainbow Tribe “Hopi and Hippie are alike, peace people are Hopi, Hopi is peace, you are all Hopi”. It was in July of the year 1983 when Thomas Banyacya himself, the official spokesman for the traditional Hopi Elders sent four seekers whom he personally inducted as traditional Hopi, out into the world from the Omega Institute in Rhinebeck, New York to look for the Baha’na. I was one of them. He told all four of us while sitting at the base of a small tree in the midst of a very large, open field, that we should look for the Baha’na whom he said would be either a very young boy or a very old man at that time. He said we would need to learn the Song of the Baha’na and do whatever we could to bring the traditional Hopi people and the Baha’na together if we found him, as time to lessen the destructive aspects of the Great Purification was running out and the Baha’na was the only one who could lead all humanity through it with his New Song which the Hopi did not yet know how to sing. After the passing of Grandfather David, in all, three (3) messengers went out from the place called Massauwa, the prophesied address of the Baha’na sent by the Baha’na himself in an effort to bring our traditional, spiritual people together with him to learn the New Song. The first went directly to Hopi Land and was turned away without being given any audience at all, not even so much as a chance to speak before the traditional Hopi Elders. This was the Creator knocking on the door of the Hopi a first time. It corresponds to the prophesied “first shaking of the earth with one hand”. The second met Thomas Banyacya, spokesman for the traditional Hopi Elders in 1987 during the time of the Harmonic Convergence at the home of Jose Arguelles in Colorado. Specific, detailed proof was handed to him by an emissary of the Baha’na yet no conversation followed. No response ever came from Thomas Banyacya or the traditional Hopi Elders. This was the Creator knocking on the door of the Hopi a second time. It corresponds to the “second shaking of the earth with one hand”. In July of the year 1987 during the time of the National Rainbow Gathering in the Cherokee National Forest of North Carolina I was told of the Baha’na by one of his traveling students. I then realized I had to see the proof that he was in fact the Promised Baha’na of Hopi Prophecy for myself. I traveled to Missoula, Montana, which is in the Hopi language “Massauwa”, the name of the place of the Baha’na, where I learned the New Song directly from Him in the second half of the month of August, in the days immediately following the time of the Harmonic Convergence (Aug. 16-17, 1987). Afterward I began looking for the path by which to deliver the message to the Traditional Hopi People to come forth and learn the New Song from him and then meet The Guardian of The Land. For a few years I explored many paths by which to bring the Hopi Elders together with their long-awaited Baha’na but no opportunity availed itself. As explained earlier in this letter, Great Spirit had already sent two other messengers (angels) before me from the Baha’na to knock on the door: my message was the third knocking. This corresponds to the Creator knocking on the Hopi door a third time. The third shaking of the earth is yet to come; as it is with two hands the Creator will do this. At that time the inhabitants of Hopi Land were embroiled in conflict among themselves and the call of the Baha’na passed along by me, the third messenger, to Joseph the Seeker, and delivered directly into the heart of Hopi Land and Life was rejected once again. This was the third time the message of the Baha’na had been delivered and rejected. 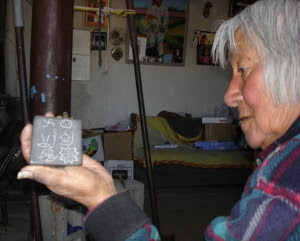 One year later, in the summer of 1994, I received a message on my radio pager from the “Hopi Cultural Preservation Office” stating that they wanted to find out about the missing cornerstone of the Fire Clan Tablet and the one who had it as they had heard all about it from Joseph the Seeker. I called them back and told them I would have to contact the Baha’na to receive his specific instructions on how to proceed. I then contacted Him directly and He told me exactly what He wanted me to tell them. He told me that I would know if they wanted their Promised Baha’na and the New Song or if they only wanted a piece of stone for their museum case. I called them back immediately, delivered the Baha’na’s message to them exactly as he spoke it to me and their response told me all I needed to know. They said they would be in touch with me, we exchanged polite goodbyes and I never heard from them again. That was the end of the third knock. Now, at this time when the River has been turned to Blood (Animas of the San Juan and Colorado Rivers that flows through the Heart Land – http://www.bahaijustice.com/2015/08/11/prophecy-fulfilled-and-the-river-was-turned-to-blood-kamal-11-172-b-e-8112015 on August 6th, 2015 exactly 70 prophesied years from August 6, 1945 when the “gourd of ashes” was dropped on Hiroshima from the Uranium mined from Four Corners Area; and the waters that have heretofore nourished not only the Hopi but the Land and Life of all the peoples of the Colorado Plateau and beyond are poisoned with toxic heavy metals and other deadly chemicals from deep within the earth; at the time of the Fourth Blood Moon; Great Spirit calls me to knock for a final FOURTH TIME as third emissary sent by the Baha’na (turning back to face the Hopi a second time) and call the One-Hearted among them to take up the Bow of the Covenant and learn the New Song as taught by the Baha’na, the Promised One of the Hopi and all other peoples. The missing cornerstone is a real, living person–he is the stone the builders rejected–even as we are all living stones in the holy temple of living earth. The physical cornerstone artifact, like the physical missing capstone (missing top cornerstone) of the Great Pyramid are material physical stone symbols of this real, living person (a human being who is precious) who is the actual “missing” cornerstone–missing because the two-hearted builders reject him: and the people who have deaf ears only faintly heard the first three knocks. This fourth knocking is the last. Thus Great Spirit shakes the world first with one hand to try to wake the people up; then a second time with one hand again to try to wake it up. These were the first two knocks to the Hopi people by the first two messengers (angel means messenger) sent to them by Baha’na. Now the third angel (messenger from Baha’na) knocked for the third time in the 1990s and now with “his other hand” knocks again as the “River has turned to blood” exactly “3 ½ times” (a time being a score of 20 years: 3 ½ x 20 years = 70 years) from the ground zero date of the Hiroshima bombing on August 6, 1945. This fourth knock by the third messenger is the Great Spirit shaking the people awake with “two hands.” This is happening in time for the unmasking of Blue Star Kachina and the completion of the 49.98 years Jubilee cycle of double star Sirius in the night sky. This is the final, third shaking with “two hands” by the third messenger to the Hopi–signaling that the first Great Shaking of the World (World War I) and the second Great Shaking (World War II) by Great Spirit each with only one hand is NOW to be succeeded by the third Great Shaking of All the World with “two hands.” This third great shaking according to Grandfather David is to be World War III in which one third of humanity is prophesied to be killed in one hour of thermonuclear war with every American City population 100,000 or more to be destroyed. This unleashes the four winds held back at “four corners” that Grandfather David has forewarned: the fourth and final wind being the “earth’s shifting crust” because of the crimes against mother earth in the failures of all the peoples of the world to follow Great Spirit’s instructions, according to Grandfather David, Wovoka, Black Elk, Sitting Bull, all the Hebrew Prophets, White-Buffalo Calf-Woman, Rolling Thunder, Long Standing Bear Chief, Red Crow and the other prophets, elders, teachers, medicine men and women and shamans of all races creeds and colors sent to warn all the peoples of living Gaia. The Guardian of the Land is now alive in the world (https://www.createspace.com/356540) and he awaits (ready to help and serve) your return to the True Path of Peace, the path of the True Hopi. Who among you will answer his call? Light & Love for all. What has happened in our New Jerusalem from the years 1996 on August 6th until recently? The Covenant-breakers have attacked the Twin Establishers of the Baha’i Faith, the prophesied Joshua and Zerubbabel–the two witnesses mentioned in Revelation chapter 11–that bear witness to the Reality of the twin Testaments of the Kitab-i-Ahd and the sacred Will and Testament of ‘Abdu’l-Baha. These attacks have been levied against the person of the living Davidic King (the guardian) in every way imaginable and unimaginable, but God has prevailed against these peoples and “brought forth his servant the Branch” (Zech. 3:8 KJV) in the year 2001 AD. In 2012 he announced his “four corners medicine wheel prophecy” re-activating ‘Abdul-Baha’s Tablets of the Divine Plan. This meant the election of the first US National Council since the violation of the Covenant in 1957-1960, which took place in Ridvan 2015. This disaster has occurred EXACTLY 19 years [one vahid] to the day of the ascension of the Establisher, Knight of Baha’u’llah, Dr. Leland Jensen: August 6th 1996 + 19 years = 2015. [In addition it is exactly 70 years to the day from the dropping of the atomic bomb on the Japanese city of Hiroshima, the act which fulfilled the “Gourd of Ashes” prophecy given by the Hopi people. 70 years is the prophetic Biblical time cycle given as “a time, two times, and half a time”, where a “time” is calculated as a score which is 20 years.] It should be kept in my that I gave the date for the Trade Tower 9-11 from the start date of his ascension in 1996 on this very day of August 6: see chart Collapse of the Two Towers: Second Woe – Prophecy Chart. This current “river to blood”: thus fits into the extension of this prophesied time line of the “three woes” in the prophesied Cycle of the Seven Seals I have explained in my firesides, deepenings and table talks that has occurred in time for the prophesied “four blood moon” events (the Tetrad) that takes place in the Guardians 49th year (1966 + 49 years = 2015) and then the jubilee. In my mission it states: “He will lift a signal flag [Divine Standard, Banner of the genealogy of Baha’u’llah http://www.bupc.org/genealogy/genealogy-of-christ.html] for the nations; he will gather Israel’s dispersed people and assemble Judah’s scattered people from “the four corners” [Colorado Plateau] of the earth” (Is. 11:12 Net Bible). The river turning to blood is the signal of the flag of “the blood of the Covenant” being raised in that area and the attack by those whom Baha’u’llah calls “the manifestations of satan” against our efforts [“Michael and his angles fought” Rev. Ch. 12] in the promised area of the four corners that includes all sacred spaces on the Colorado Plateau and Grand Mesa/Chair Mountain area and is the signal for the judgement and defeat of “satan”: “Satan will be released from his prison [Covenant-breakers attack the guardian seated upon King David’s throne (Michael and his angels–see Rev 12 for the 6-66 Injunction)] and will come out to deceive the nations [turn the people away from Michael and his angels] that are at the four corners of the earth, Gog and Magog [Ez Ch. 38 and 39, Russia will be dragged into this at this time], to gather them for battle [oil battle for control of the Middle East]; their number is like the sand of the sea. And they marched up over the broad plain of “the earth” [they were the ex-followers educated by Dr. Leland–the land–Jensen’s teachings] and surrounded the camp [camp Bahá] of the saints [guardian’s personal home and family] and the beloved city [New JerUSAlem in the Rocky Mountains], but fire came down from heaven [the heaven of prophecy] and consumed them, and the devil [personal individual arch-violators–whose symbol is the dragon–see Rev. 12] who had deceived them was thrown into the lake of fire and sulfur where the beast [materialists, partiers, drunks, adulterers, deceptive music, false merriment, money-mongers, shopaholics, and drugs (Matt. 24:38, 39)] and the false prophet were, and they will be tormented day and night forever and ever” (Rev 20:7-10 ESV). So it is written “and [the two witnesses: Joshua and Zerubbabel] have power over waters to turn them to blood” (Rev. 11: 6 KJV) that ‘Abdu’l-Baha explains this verse in SAQ: “if they wished, they could turn the water of the Nile into blood, so far as the Egyptians and those who denied them were concerned—that is to say, that that which was the cause of their life, through their ignorance and pride, became the cause of their death. So the kingdom, wealth and power of Pharaoh and his people, which were the causes of the life of the nation, became, through their opposition, denial and pride, the cause of death, destruction, dispersion, degradation and poverty. Hence these two witnesses [who have returned and appeared repeatedly in every dispensation with different names in different places] have power to destroy the nations” (‘Abdu’l-Baha, SAQ, Commentary on Rev Ch. 11). What is the mysterious Power of “Michael and his angels” that comes not from money, nor politics, nor prestige, charisma or material backing? Why are all the forces in the universe unable to prevail against it? Why has the Faith grown to now encompass Iran, Bangladesh, India, all of Arabic speaking Islam, the Urdu speaking peoples, India, Syria, Turkey, the Middle East and those in Russia, and the Far East? The more the hounds of personal appetites push against the truth–the brighter the fire of this unquenchable flame! The more they make fun of and attack the true believers in their very own homes, and inner family circles, the more God promises to save the pure of heart and spread the Faith far and wide. Does he do this to see the “unbelievers destroyed”? The Muslim, Christian and Jewish clergies would have you believe so, but the unbeliever is destroyed when he becomes a believer. And the wicked is destroyed when she becomes wise. Thus all shall taste death and become believers and wise souls after their mortal coil is bled dry–but most will believe in this wisdom–if you can call it that, says Paul–a crazy-wisdom (1 Cor. 1:20) that is foolish to the worldly-wise–who are looking into the Kingdom from far, far outside, and are unable to enter the Kingdom as Jesus said “not my will o Lord but thine”–not a threat but a fact–that they lack the capacity to serve that which is “other” than what ‘Abdu’l-Baha calls their “ever insistent self” and these instead fall by the sword of their own appetites into grievous errors–because they would have it NO other way. So the victory belongs to those who have died now (NDE), died away from self and passion, died away from old habits, from their stuck-up orgies, and “a’whoring around after false Guardians” as Dr. Jensen has said. Behold they have “died” and yet live for ever more” now in this life and in the next–but only for those who have seen the VISION, climbed the Mountain, so to speak, been filled with the Spirit, that do not apostatize their faith, but deepen in his loving kindness–“used their intellect to defeat antichrist”–for God so loved the world he sent his only begotten son that we should have life-eternal: and the son gave himself willingly though the masses comprehend him not! The hour has come in which the “golden censor” (of Positive-Leap 80) is filled with fire (9-11) and burning coals (4-11) from the “altar” and thrown upon the earth. This from the time of Dr. Jensen’s world wide media projection in 1980 and filled now with “fire” in the prophesied time of the jubilee of the tetrad blood moons in our day today. The prophecy of the “Blood river” is one of the greatest disasters ecologically in US history. Its flow down through New Mexico and Arizona is the sign to awaken the native people to the fulfillment of this real vision as we gave the “nine pointed star” back in the 1980s, and Dr. Jensen and his angels delivered the “missing cornerstone” to the Hopi peoples of these areas with the Navaho yet they rejected him and he was denied–but now they give the signal of the cornerstone restored by Grandfather Martin as Dr. Jensen and his angels gave it to them. These nations will accept the Divine Banner and it shall be hoisted in their midst to all the people of the world. THE RIVER TURNING TO BLOOD IS THE SIGNAL. The Covenant and the Manifestations are the foundation of civilization: as civilization if founded upon the spiritual qualities and attributes of God such as love, justice, honor, trustworthiness, mercy, humility, etc. We cannot have a society or any group activities without these basic qualities of co-operation and mutual respect! As these spiritual qualities and attributes emanate from the personal reality of God himself and are established as his image within creation in the appearance of the divine manifestations of God these are the glue of any group cohesion and effort. The attack on these 9 and the separation from the root of these Divine Revelators of progressive civilization is the downfall of society and the havoc (collapse) of the financial booty of war for the greedy and small minded. The greedy oil people and corrupt leaders of our cultures have either abandoned all hope or gone against this living spirit of Christ and thus we have the absence of these qualities in war, pestilence, famine, disease, ignorance and the disintegration of civilization. This disintegration is so that the spiritual people of the nations and those beginning at the four corners will establish a true spiritual civilization–having tasted the blood of his covenant that recompenses the blood of the martyrs—-not like a corrupt society like that which is dying out right now. The release of this blood from the heart-land of the four corners (its inward spiritual purity of the blood of the covenant and outward lethal poison of the rivers) sets the signal for these events to unfold. Blessed are those who have eyes to see and ears to hear. This spread throughout Utah and New Mexico into the Colorado River and Grand Canyon and has poisoned the water supply for Arizona and California that is now even in draught. The Guardian, The living Davidic King can be contacted here: info@UHJ.net. Prophecy is always fulfilled but expectations are not. Wake up O People, says Baha’u’llah, for your time is short. What happened to Long-Standing Bear Chief of the Blackfoot (Pikuni) Nation and the Lakota family of Sitting Bull? Native American Baha’is and indigenous peoples in general of all other Native American Tribes have been fast finding-out that the Covenant of Baha’u’llah has been violated by the “Hands” in the year 1960 when they separated themselves from the son and appointed successor of ‘Abdu’l-Baha, Charles Mason Remey Aghsan; and that Ruhiyyih Khanum and those that followed her, murdered Shoghi Effendi (the first guardian of the Baha’i faith) and all their followers have separated from the Covenant and true successorship of Baha’u’llah seated upon the throne-line of King David (of the Tribe of Judah) that is to last forever. Like most people–who are burned by corrupt organized “religions” they leave the church organizations of man but still accept the reality of the Founders–Buddha, Jesus, Muhammad, Moses, Krishna, etc. and continue to worship God in their own way–these too still accept Baha’u’llah, but due to the sting of the violation of the Baha’i Covenant they have been unable, for the most part, to re-gather under the provisions of the Covenant until recently. This is what happened with all the American Baha’is in general during the days of ‘Abdu’l-Baha. When his half-brother Muhammad-Ali broke the Covenant the people became poisoned and perturbed and were unable to have fellowship with one another at Baha’i gatherings. After ‘Abdu’l-Baha’s journey to the U.S. in 1912 this situation was reversed as the American peoples (native, white, brown, black, yellow, red–everyone of all creeds and colors) were able to meet with ‘Abdu’l-Baha in person; and through the love of ‘Abdu’l-Baha these blossoms on the tree of life were re-grown and flourished once again. This is what has happened in the Native American world since the 9-11 in 2001 through the love, education and service of the great-grandson of ‘Abdu’l-Baha, Neal Chase. In the Baha’i library there is an excellent file on Hopi Prophecy called, “Traditional Native American Prophecies.” It is a beautiful testament to the Baha’i Faith. The Author of the document is Lee Brown. He is a scholar and teacher (Ph.D.) of Aboriginal values and epistemology as well as member of the Cherokee Nation and the Wolf Clan who spent a few years in Hopi land studying the prophecies and ways of the tribes of the Southwest. While at Four Corners in Arizona Lee had visions and realized that the Baha’i Faith was the long awaited “New Religion” for the Native peoples of the Americas as well as Baha’u’llah being the One spoken of in all world faiths and promised to come in all wisdom traditions. Since Lee Brown recognized Baha’u’llah, the administrative leadership of the “Baha’i World Faith” has used his testament for years to introduce people to the Baha’i Faith without their informed consent and knowledge of the great Covenant-breaking takeover–“Baha’i Gate“–that occurred in 1960. When Lee Brown came into the Faith, he was so convinced and motivated that it was the true religion of Wakan Tanka (The Great Mystery) that he was able to bring in hundreds of Coast Salish Native peoples from the tribes in British Columbia where he now works and lives. There were mass declarations. But something went wrong. You see, it is a fact that Lee Brown and his wife and the entire Coast Salish tribe of BC have torn up their membership cards and none of them attend any administrative “Baha’i” functions any more. Where is Lee Brown? One day, while the “Guardian of the Land” was living in Missoula (Masauwu) Montana, the people facilitating the local Baha’i Center received a phone call from Long-Standing Bear Chief of the Blackfoot Pikuni Nation. He was very angry and wanted to redress grievance (which is his right) against the Baha’is. The people became scared and reported this contact that day at the weekly Forum of Dr. Leland Jensen, who always sat at the right hand of Neal, the guardian of “the Land” seated upon the throne. Dr. Jensen made a call for volunteers of people who would go up North to Browning and meet with Long-Standing Bear Chief as he requested. No one responded. Neal then said that he would go as he had always wanted to go up and visit Browning and now this was a perfect opportunity that had presented itself. Later on that same night some of the friends came up to Neal and told him, that he should change his mind, as Browning was a dangerous place and people were known to go up there and disappear. This didn’t change his mind but made him want to go up there all the more. It was finally agreed that he would go as long as someone else accompanied him. A native Montanan who happened to be Métis (like Louis Riel) volunteered to drive up there with him. On the drive, Neal said that if all this goes well, should Long-Standing Bear Chief want to smoke the pipe with them, that they should not inhale the smoke but only hold it in the mouth, then say prayers in their innermost hearts and release the smoke. His companion objected that this was some sort of slur and racial stereotype. Neal dropped the conversation. When they arrived in Browning, the town was a disaster. There were old burned out cars, unkempt mud streets, poverty, worn down trailer homes, alcoholism and other terrible things. It was nothing like the Salish-Kootenai area of Montana where the Flatheads had made alliance with “the black robes” of the Jesuit priests since the days of the 1800s and were very wealthy and have a wonderful college and strong local economy. They got out of the car and walked up to the front door and Harold Gray welcomed them in cordially, but restrained. As they introduced themselves, it was quite obvious that Harold was upset and holding something back. He proceeded to tell them that some time before he had found out about Baha’u’llah and had become a Baha’i. He was also a very powerful and erudite human rights activist. He told of how he had accepted the 12 principles and had fallen in love all over again with God having found the truth of his own native tradition fulfilled in our day today. As he said this he became more and more agitated. It turned out, that he had no idea that he had joined that Covenant-breaking outfit that was only masquerading as “Baha’i.” Recently something terrible had happened and those Covenant-breakers had broken up his family and declared that his wife and children should completely shun and avoid him, and he had lost all contact with his wife and children including his son that was to succeed him in his life-traditional work. He was very upset about this. It was at about this time as he was standing before them, and they sat upon the couch, and he was shaking and raising his voice, that Neal finally got his attention and interrupted him. He asked if he could speak and just say one thing. Harold calmed down and recomposed himself, and said yes, and then Neal told him that they were the Baha’is Under the Provisions of the Covenant, and that the whole Baha’i world had violated the Covenant and that many, many people had suffered through these similar types of family breakups destroying marriages and harming the children. He said in fact he had seen this among the Native Americans as well, when he had met with a great-grandson of Sitting Bull previously in Mobridge, SD, and that Harold Gray was not alone in this calamity. Harold was perplexed. He said that he did not know that Neal was not with that Covenant-breaking group when he called the Baha’i Center in Missoula. He said he was still so upset that he did not know what to do with himself. He said that he understood that the guardian also had been exiled and persecuted by these same nefarious peoples. But he said that he just had so much pain and turmoil inside of him over this that he just had to let it out and that he had already planned to do so this day. The Guardian said to him, “I understanding fully. Please go ahead and continue. We will sit here with you and listen to you no matter what you have to do until you have decided that you are done.” He then opened up, and the mightiest and heaviest torrent denouncing injustice and corruption such as one couldn’t possibly imagine came pouring out of him covering 400 to 500 years of oppression since 1620 AD (Plymouth Rock) and 1492 (since Columbus) until the present time, mixed in with broken tragedy and weeping over his lost family, and strong valiant statements of the promises of God for justice and freedom for all and what was to occur at the time the “Napi” appeared. He paced back and forth in his oration making his stand and statement, and then “ahou” he was done. Today, the “River Has Turned To Blood” (Rev. 16:4-7) that runs through “Four Corners” (Is. 11:12 KJV) and Hopi land. The signs of God are fulfilled and the time for all the people to awake has arrived. Watch FREE Baha’i FIRESIDES ON-LINE! My God! My God! I ask Thee to forgive everything save my servitude to Thy Supreme Threshold, and I declare myself innocent of any proclamation or praise, save my adoration for Thy Merciful Presence. I deprive myself of every adornment, save that of humiliation and contrition and evanescence before Thy Oneness. I flee from every station save that of arrival in the court of Thy Divine Eternity. By Thy Power, verily, the sweetness of servitude is the food of my spirit; with the fragrance of servitude my breast will be dilated, my being refreshed, my heart delighted, my eyes brightened, my nostrils perfumed, and in it is the healing of my disease, the allaying of my burning thirst, the soothing of my pain. Immerse me, O my God, in this most bounteous, rolling Ocean; give me to drink of this sweet, abundant Water; cause me to enter this Gateway of Righteousness; ordain me for this praiseworthy Station; cause me to obtain this Cup which is overflowing with the living water; light in the crystal of my heart this Lamp which is giving forth its illuminating, brilliant radiance; and strengthen me for the service of Thy Cause, O my Lord, the Forgiver! Accept my servitude in the court of Thy Holy Oneness, O Thou, the Manifestor of Mount Sinai. Assist me to abide in its conditions, O Thou, the Authority of Manifestation. Aid me to assist Thy Cause in the eastern and western parts of the earth, O Thou the Possessor of the Day of Resurrection. I ask Thee, by Thy written Book, dispersed writings — by Thy Hidden Mystery, and Thy firm proclamations — to cause me to be steadfast in servitude to Thee, O my Lord, the Forgiver! Verily, Thou art the powerful over that which Thou wishest; and verily, Thou art the Merciful, the Compassionate. He is the Mighty, the Pardoner, the Compassionate! O God, my God! Thou beholdest Thy servants in the abyss of perdition and error; where is Thy light of divine guidance, O Thou the Desire of the world? Thou knowest their helplessness and their feebleness; where is Thy power, O Thou in Whose grasp lie the powers of heaven and earth? I ask Thee, O Lord my God, by the splendor of the lights of Thy loving-kindness and the billows of the ocean of Thy knowledge and wisdom and by Thy Word wherewith Thou hast swayed the peoples of Thy dominion, to grant that I may be one of them that have observed Thy bidding in Thy Book. And do Thou ordain for me that which Thou hast ordained for Thy trusted ones, them that have quaffed the wine of divine inspiration from the chalice of Thy bounty and hastened to do Thy pleasure and observe Thy Covenant and Testament. Powerful art Thou to do as Thou willest. There is none other God but Thee, the All-Knowing, the All-Wise. Decree for me, by Thy bounty, O Lord, that which shall prosper me in this world and hereafter and shall draw me nigh unto Thee, O Thou Who art the Lord of all men. There is none other God but Thee, the One, the Mighty, the Glorified. Verily, art Thou the Invincible, the Almighty, the All-Powerful. It is evident that every age in which a Manifestation of God hath lived is divinely ordained, and may, in a sense, be characterized as God’s appointed Day. This Day, however, is unique, and is to be distinguished from those that have preceded it. The designation “Seal of the Prophets” fully revealeth its high station. The Prophetic Cycle hath, verily, ended. The Eternal Truth is now come. He hath lifted up the Ensign of Power, and is now shedding upon the world the unclouded splendor of His Revelation. In man five outer powers exist, which are the agents of perception—that is to say, through these five powers man perceives material beings. These are sight, which perceives visible forms; hearing, which perceives audible sounds; smell, which perceives odors; taste, which perceives foods; and feeling, which is in all parts of the body and perceives tangible things. These five powers perceive outward existences. Man has also spiritual powers: imagination, which conceives things; thought, which reflects upon realities; comprehension, which comprehends realities; memory, which retains whatever man imagines, thinks and comprehends. The intermediary be- tween the five outward powers and the inward powers is the sense which they possess in common—that is to say, the sense which acts between the outer and inner powers, conveys to the inward powers whatever the outer powers discern. It is termed the common faculty, because it communicates between the out- ward and inward powers and thus is common to the outward and inward powers. For instance, sight is one of the outer powers; it sees and perceives this flower, and conveys this perception to the inner power—the common faculty—which transmits this perception to the power of imagination, which in its turn conceives and forms this image and transmits it to the power of thought; the power of thought reflects and, having grasped the reality, conveys it to the power of comprehension; the comprehension, when it has comprehended it, delivers the image of the object perceived to the memory, and the memory keeps it in its repository. The outward powers are five: the power of sight, of hearing, of taste, of smell and of feeling. The inner powers are also five: the common faculty, and the powers of imagination, thought, comprehension and memory. You are currently browsing the Baha'i Justice blog archives for September, 2015.